Popular Online Retailer HomeShop18 is an active brand on Social Media. Campaigns in the past like Shoppers Bag, Samsung Galaxy, amongst other contests have been unique and insightful in terms of building an engagement and gauging audience behavior. Apart from being extremely conversational on Twitter with their followers, the brand uses this platform as a customer service platform too. So when the time came to announce the launch of the new Micromax Canvas XL A119 smartphone, which was to be sold exclusively on HomeShop18, Twitter was the best medium to announce this. HomeShop18 has launched a new campaign, which has lots of conversations buzzing on the micro-blogging site. 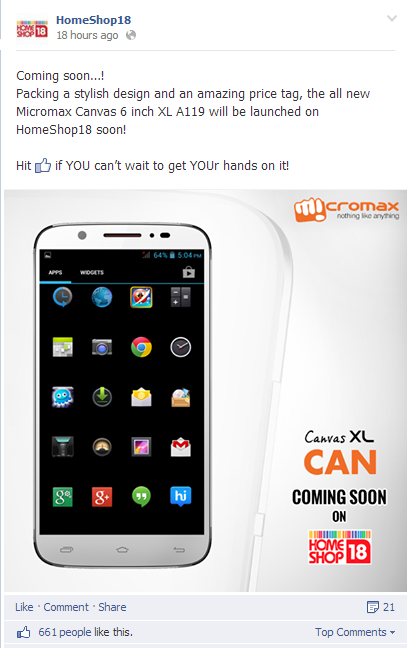 In its quest to launch Micromax Canvas XL A119 exclusively on the HomeShop18 TV channel and website, the virtual commerce giant started #OnlyOnHS18 campaign on Facebook and Twitter. The smartphone and Micromax itself as a brand are already enjoying a huge following on Social Media. The merger between HomeShop18 and Micromax is a smart strategy for both the brands. This merger extends the shopping experience from TV to E-Commerce, as the TV Show would be aired at 10am and 9pm on Sunday, January 19, 2014 followed by the web offer on HomeShop18.com. HomeShop18 began their campaign by building excitement among users for the upcoming launch. On Facebook, the cover image was changed on 17th January, announcing the launch of the campaign. The cover image is designed like an illustration and has a quirky feel to it. Followed by the change in the cover image, a post about the new smartphone was updated on the page. On Twitter, the use of the hashtag #OnlyOnHS18 clearly emphasized the fact that this smartphone is available only on HomeShop18. They began creating curiosity among their followers by posting teasers from 17th January onwards and continued posting regular teasers until their #OnlyOnHS18 contest launched on Saturday, 18th January at 2PM. The campaign has already started hitting off among tweeples and the hash-tag began trending minutes after the contest was launched. The hash tag witnessed an outreach of approx. 4 Million with more than 3900 tweets in less than 3 hours. In the contest itself, simple questions were asked to engage followers and spread awareness that the new Micromax Canvas XL A119 is exclusively available on HomeShop18. The use of their website URL as hints is a very clever tactic that increased their website traffic as well thereby increasing buzz and sales. Why I loved this concept? HomeShop18 chose to include their name in the hash-tag (#OnlyOnHS18). Such branded hash-tags work very well for brand awareness and to create a recall value on social media. Also, the brand added a recall factor by asking questions about this launch, making it a two-way interaction. They embedded the various features of the site as well as HomeShop18 add-ons. This seems to be a quick way of promoting a launch and is quite effective since the buzz spread very fast on Twitter. Created buzz that HomeShop18 is the only site to be selling this phone and getting Social Media (especially Twitter) influencers to talk about it. What makes a YouTube video tick?